If your students like doing Word Searches, then The Ultimate Word Search Maker could be just the thing for you. 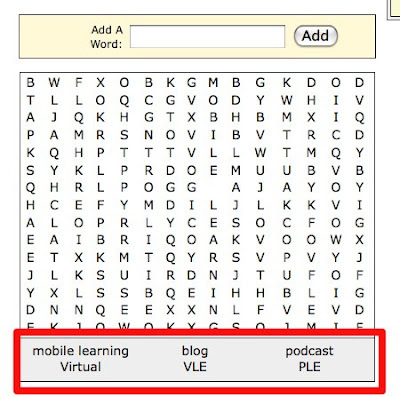 It enables you to quickly and easily create your own Word Search Puzzles and embed them into your blog. Here's an example I created for you to try out. Just click on the first and last letters of the words when you find them. The puzzles are very easy to make. 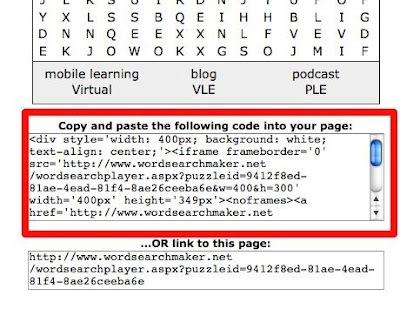 You simply go to the Word Search Maker site type in the words you want and the site will produce the puzzle grid for you with the words underneath it. You then simply copy either a link or an embed code and add it to your site. 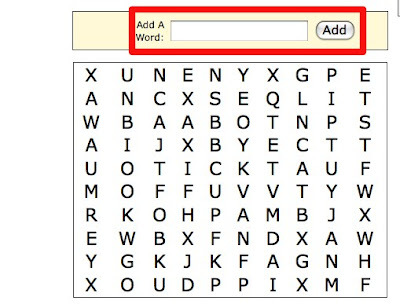 This is a really simple tool to use for those of you keen on Word Searches. For me the biggest problem with it is that it includes the words that students have to look for, so it is just a test of word recognition. I would prefer to be able to produce Word Searches that don't have the words included so that students have to think a little more around the topic and mentally revise their existing vocabulary on the topic. Well I guess you can't have everything and it is after all free, so..
Hope you find The Ultimate Word Search Maker useful. You just click on the first and last letters of the word.